A green tide nearly caused the cancellation of the Beijing Olympics sailing competitions and has since become an annual occurrence. A recent article in the journal Phycologia investigated the most significant factors behind this algal bloom in the Yellow Sea. This green tide has occurred subsequently every year in the Yellow Sea and is a major global environmental phenomenon by covering thousands of square kilometers of ocean. The article “Adaptations of a green tide forming Ulva linza (Ulvophyceae, Chlorophyta) to selected salinity and nutrients conditions mimicking representative environments in the Yellow Sea” explains that the algae disperses and fully matures even as it moves through wide-ranging salinity and nutrient gradients. Scientists studied the physiological responses of separate growth phases of U. linza in three simulated saltwater settings that replicated salinity and nutrient conditions from estuaries to the near shore to the offshore. They successfully demonstrated that the different life stages are differentially adapted to the salinity and nutrient that they encounter from seeding the bloom, to its initial growth, and then its maintenance in the open ocean. The experiments showed that the adult thalli underwent synergistic effects of high nutrients and high salinity on photosynthesis that enabled them to grow quickly in normal saline settings of coastal waters. The article suggests that areas with high salinity actually help U. linza to bloom along with a continuous nutrient flow that allows U. linza to sustain growth and thrive offshore where nutrients are low. Overall, it was determined that nutrients are the most significant factor for development of U. linza. Growth can accelerate in low-salinity conditions when the environment also contains high levels of nutrients. The circumstances used to study the growth patterns of U. linza are the same as the environment found where the green tide starts in the Yellow Sea, which has been at an elevated risk for destructive algal blooms due to a high number of nutrient inputs from agriculture and human waste. In this case, these input nutrients act as the trigger for blooms that occur in the Yellow Sea, ultimately supporting the idea that it is critical to limit nutrient aquaculture and sewage waste that flows into the ocean in order to reduce the size and frequency of algal blooms. Full text of the article, “Adaptations of a green tide forming Ulva linza (Ulvophyceae, Chlorophyta) to selected salinity and nutrients conditions mimicking representative environments in the Yellow Sea,” Phycologia, Vol. 55, No. 2, 2016, is available at http://www.phycologia.org/doi/full/10.2216/15-67.1. 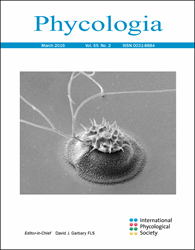 Phycologia is published bimonthly by the International Phycological Society and serves as a publishing medium for information about any aspect of phycology, basic or applied, including biochemistry, cell biology, developmental biology, ecology, evolution, genetics, molecular biology, physiology, and systematics. Learn more about the society at http://www.intphycsoc.org/.